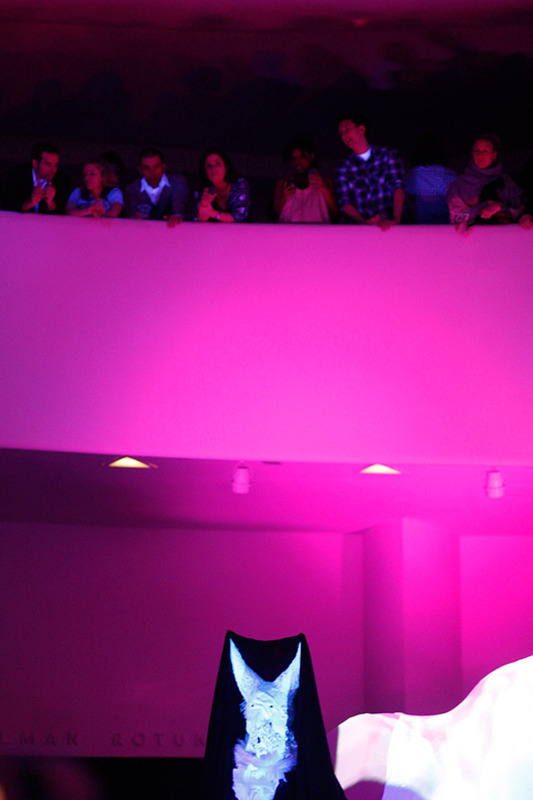 Animal Collective and ODDSAC director Daniel Perez took over the Guggenheim Museum in New York City yesterday. We scoped the scene. Hit the jump for our review of all the peace drone costume party madnes you can take, plus more of Jason Nocito's rainbow photos. 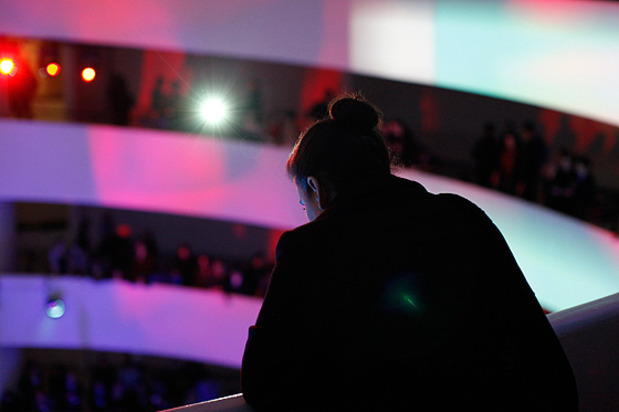 Last night, at Animal Collective's weird installation at the Guggenheim, it took a full hour and a half until I checked my email on my phone. That's pretty good for a meandering semi-social event. That's also about the length of a good Disney movie, which is what Daniel Perez's overtaking of the lobby recalled, a sort of bleak Fantasia with no words and a woozy soundtrack. Rumor had it that three members of Animal Collective—Deakin, Avey Tare and Geologist—were actually up there, amidst the hologram-fabric tent and the icicle-ridden mirror bar, standing mostly motionless wearing papier maché Cthulhu-inspired, hairy snake beard masks. It was as though the members of Animal Collective had crashed the museum floor with their ship, an accidental landing reminiscent of a way less gross version of the alien confusion in District 9. But what about the music? Well, it might be wrong to call it that, though most of the face-painted and Zen-zoning freaks didn't seem to mind. What's a little loose drone between friends? Most likely prerecorded—it was difficult to believe anyone could play anything, face masked and with limbs tethered underneath all that fabric—the sounds were reminiscent of noise music in their lack of structure, though never approaching anything heavy or harsh. Largely electronic based, it was like the extremely complex version of a white noise machine, their attempt at mimicking the naturally obtuse sounds of nature. Imagine whales underwater calling each other, metallic pings shuttled by baby waves. The sound gave the illusion of texture, but was it wasn't deep, as though it was just the base layer to a very multi-tracked Animal Collective song they never actually got around to playing. 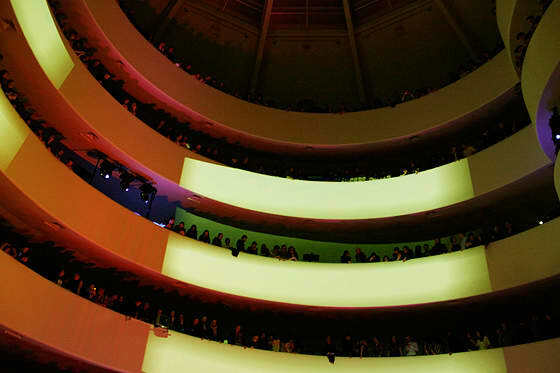 But the way the sound was delivered, through tight speakers posted periodically up the Guggenheim's spiral ramp, was genius. No one place was better to listen than any other, and the as you moved from one spot to another, climbing or descending, it gave the effect of a sound morph, clean tones shifting their wash. Never particularly loud, the sound eventually fused with various chatter, pools of people assembling impromptu cocktail parties or waiting in line for the bathroom. 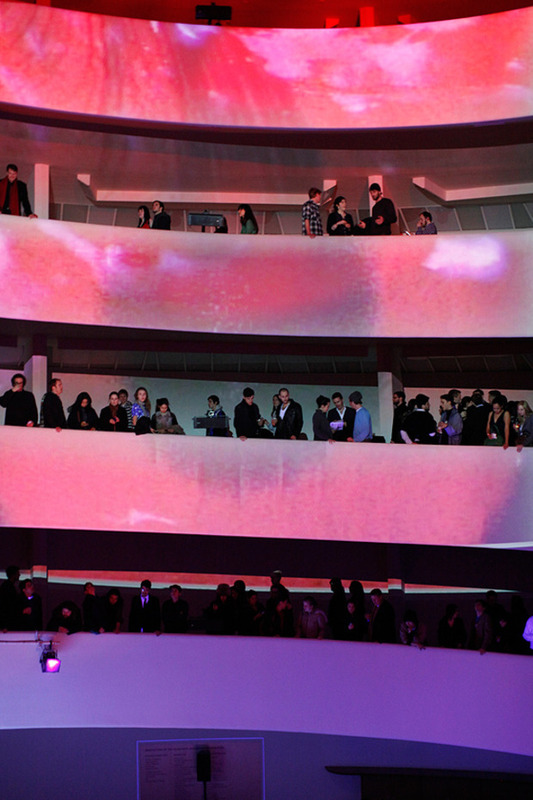 Planned or unplanned, the social element of "Transverse Temporal Gyrus," the installation's official title, was the true pleasure. 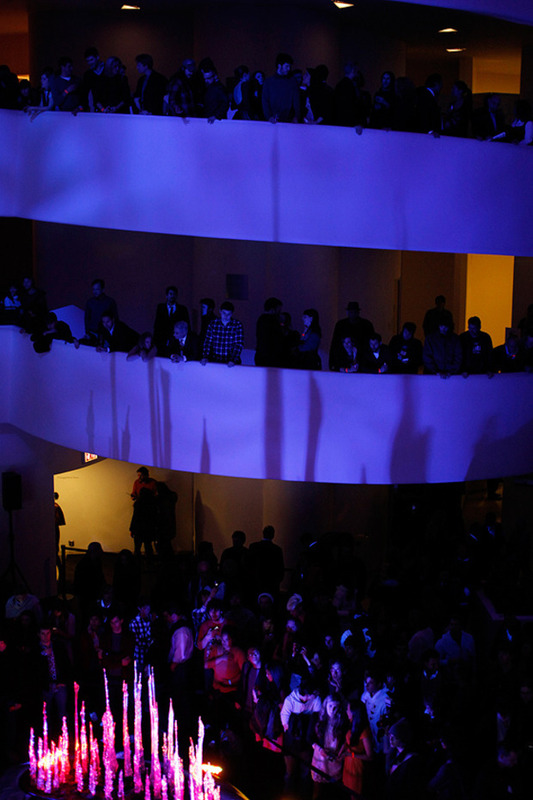 The Guggenheim is currently empty of hanging art, and, built as one swirling ramp, encourages undistracted visitors to stroll upwards, peak over the edges and keep going. The bars served absinthe, bad wine and Dos Equis beer, and most took advantage of some substance to ease up. The "Transverse Temporal Gyrus" is the area of the brain that first absorbs sound. But it also sounds like the name of a fraternity. Though the event barred no obvious resemblance to Greek Week, the community vibes of like-minded young folks partying with booze and whatever else they could ingest doesn't ring too far from the principals of a ratty frat party. It's a wonder no one, staring down at the bright lights below, tumbled over the edge enchanted.